The N1 Highway with its colourful Oleander bushes on the centre island. Driving on South African roads can be quite an experience for visitors from abroad. In fact driving in Cape Town and driving in Johannesburg is so different its like driving in another country. Funnily enough its not the rules of the road that are different but the way people in the different provinces apply the rules. South African drivers are always in a hurry so hate to be held up by a slower driver or someone in a smaller car. On a three lane highway the right hand land is the fast lane and some drivers think that they own this lane. Often driving in the other two lanes one is held up by slower traffic and has to make use of the third lane. Drivers of the luxury cars either will not let you into the lane until they have gone past or drive so close to your tail if you manage to get into the fast lane that you think they are going to ram you. For them it does not matter if you are overtaking a large truck or a line of slow moving traffic as long as you get out of their way. Sometimes these aggressive drivers drive into the yellow lines on the far right of the highway to overtake you. I have had many experiences where I am driving in the fast lane with a slower car in front of me and someone comes up from behind thinking that he can drive faster than I am in the same spot that I have on the road. It's absolutely crazy. The main roads around Cape Town are not much better especially where our minibus taxis are concerned. The taxi drivers show absolutely NO RESPECT for other vehicles on the road. They tend to drive on the right of the road and look for their passengers on the pavement on the left hand side as traffic on the left is too slow for them. Of course the holdups and slow traffic are caused by them swinging across into the left hand lane when somebody needs to picked up or dropped off. If you happen to be next to them when they want to cross they just force you to allow them in, and then once in the left hand lane they stop dead and block your progress for a couple of minutes while they load their passengers. Hooting and gnashing your teeth has no effect as they are completely deaf to complaints of other road users. If you really upset them they take out a gun and point it at you and you end up the victim. Of course once they have loaded their passengers they pull away without looking and if you happen to be next to them its up to you to give way or take the consequences of your actions. In South Africa a large proportion of our road deaths are pedestrians. Many of them caused by people walking and crossing roads without looking. The people seem to have a death wish or just don't know that if you are hit by a speeding car you can get hurt. The old adage “ Keep death off the roads, drive on the pavements” is something that might just work here. Speaking about a death wish, I witnessed a man trying to cross the N1 highway on a blind corner where traffic moves at 120 kilometres per hour most of the time. The miracle of him getting to the centre island was something to behold, but just how he got to the other side without getting killed was a bigger miracle. After having taken on traffic as a pedestrian in France a number of years ago I think this man must have been French and was hoping that someone would stop and let him cross. In South Africa he might have got across the first lane but somebody would have knocked him over in one of the other two. 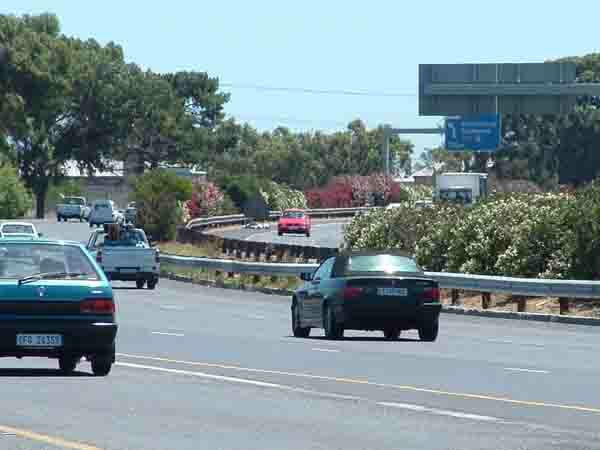 Driving on the highways around Cape Town could be quite a surprise for overseas drivers. Keep left, overtake on the right is the norm anywhere where traffic drives on the left hand side of the road. Cars overtake you left and right. I think Cape Town drivers must have learnt to drive in Bali. There it's a free for all and even after driving on our roads you would not get me behind the wheel of a car there. Yes, driving in South Africa can be quite exciting so when you get here be prepared. 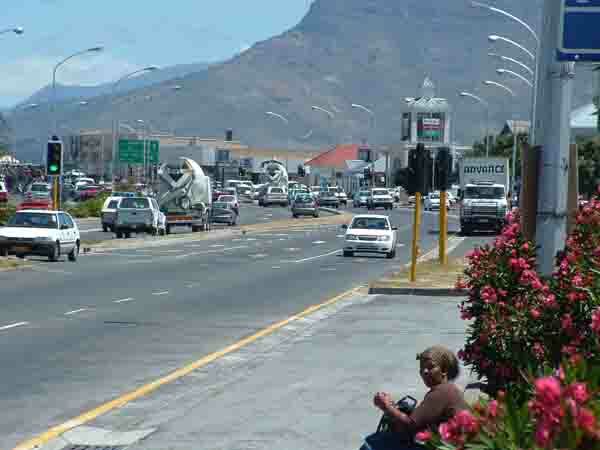 Koeberg Road Milnerton with Table Mountain in the background. Having read the above I trust that you need some tips to drive on our roads, well just read on. Don't like traffic jams keep off the roads between 6.30am am 8.30 am in the mornings and from 4.00pm to 6.00pm in the evenings. On most roads traffic drives faster than the laid down speed limits. You can drive at the higher speeds but be on a lookout for hidden cameras especially under bridges and in areas where the speed limits are lower (60-80 kmph areas). Traffic lights in certain areas have cameras for those who jump red lights. Beware of them as fines are costly and photos are taken from the rear of the car. Traffic officials like soft targets so not wearing a seat belt could cost you a largish fine if you are caught without one. Small children should be strapped in at all times. They become missiles in an emergency stop or accident. Using cell phones while driving is considered dangerous and traffic officials are on the lookout for people doing this and fines are substantial if caught. Drunk driving is a serious offence and two beers will put you over the legal limit. Being caught could cost you your motor vehicle, a large fine or time in jail. Knocking over a pedestrian is a serious offence even if the driver is not at fault. It will be up to the driver to prove that he was not guilty to get off a culpable homicide charge. The N2 highway to Somerset West is dangerous after dark. Be on the lookout for pedestrians and animals in the road and in certain areas for people throwing rocks off bridges onto the cars. Rock throwing happens from time to time along the N2. Do not stop on the N2 near the townships as you could end up being robbed, mugged or have your car stolen day or night. The CT International airport is situated on the N2 highway. Always leave youself enough time to get there if you want to catch your flight as there are often delays on the N2. Parking at the airport can be a problem so its better if someone can just drop you off and leave straight away. In Cape Town there are parking attendants who will take your money up front and then watch your car and charge you for the difference if you stay longer than you said you would. At shopping malls or any other place where parking is free you will be confronted by a security guard who will want to look after your car. These days most of them are semi employed to guard the cars and are reliant on you for payment, if when you get back your car is still as you left it. You are not obliged to pay them and if you do a silver coin or two will suffice. Guarding you car at night could be life threatening to the guard so a larger payment for his services should be considered. Hijackings and car breakins at traffic lights happen frequently these days. Always keep valuables out of sight and preferably in the boot of the car. It only takes a few seconds to break a car window and grab your handbag, cell phone or clothing. In traffic you stand no chance of catching the thieves. Certain roads are more dangerous than others so it pays to be alert all the time. Hijackers do NOT look live thieves when they stand on street corners as they are normally well dressed. Be EXTRA careful when you see someone like this at a traffic light. Always watch your rear view and door mirrors for people approaching you from behind. If you can, leave a gap for yourself to escape through in need. Do NOT argue with the hijacker or thief as you never know when they are carrying a gun or some other weapon. They are quite prepared to use them if you resist. A car is replaceable, YOUR LIFE NOT! When driving on South African roads always keep to the left and obey the road signage. It's there for a purpose.